So it's no secret that I love to read and enjoy doing so. Since I received my tablet I have read more books in the last 5 months than when I was in college and had assigned reading for all my English classes combined (as an English major that's quite a lot). When I was given the opportunity to review the book, "Haven a Stranger Magic" by D.C. Akers a while back I was really excited and enjoyed it quite a bit. So I knew I couldn't wait to read the second book, "Haven: Revenge of the Viper." The premise of the Stranger Magic where the story is about a single mother raising her two teenage children in a small little town. Sam and his older sister Sarah constantly fight, like most siblings do. When weird things start happening for both children, they are scared to tell anyone for fear of not being believed. "Sam Dalcome’s world has turned upside down after discovering magic is real. After barely escaping the caves with his friend Travis he begins to piece together the past day’s events when he stumbles onto his mother’s secret past. With the clues mounting, Sam must dig deeper to uncover the truth that could change his life forever." Revenge of the Viper picks up right where Stranger Magic left off, and gives you a background story of where Sarah, Sam and their mother come from originally. This was really a great follow up to the original book and answered all my questions that were left from the original book. I love the twist from the real world characters into a supernatural story. With DC Akers style of writing you are always anxiously awaiting the next page. Recommendation: Fantastic for any sci-fi lover, well written and well worth the read. This book is a fantastic addition to the series and I recommend it to anyone who likes science fiction novels. 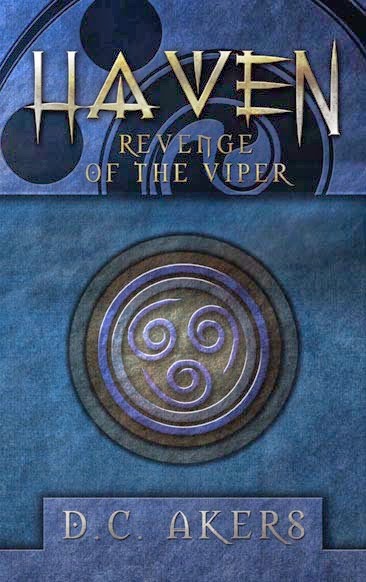 Giveaway: DC Akers is going to give one of A Lucky Ladybug's lucky readers a Haven: Revenge of the Viper of their own! I would have to say Phoenix also! my favorite mythical creature is the unicorn.